Made of high quality polymer in state of the art knitting machines by Rishi Packers Ltd.
Economizes photosynthesis to stimulate plant growth, controls water evaporation and conserves waters, optimizes shading level and temperature requirement, minimizes plant stress and wind pressure therefore resistance from high wind & U.V. radiation. Shades available 25% to 90% Width 2 to 8 mtr, length 50 & 100 mtr, Colour : Black, Green, Mixed etc. 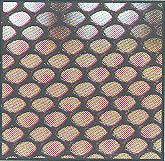 Manufactured by Perfect Polymesh a reputed brand in widest range of polymer mesh and nets. Maintaining the same quality standard with the monopolistic competitors but cheap by at least 15% in price. 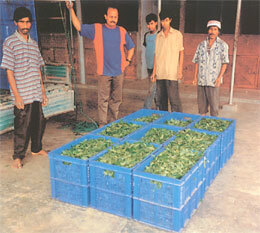 Available ready stock all over the tea growing areas. Type I, II & III in 1.83 mtr x 25 mtr roll size. Weight 17-18 kgs in Type I & II and 30 kgs in Type III, Standard colour Black but white colour and specific width also available on a minimum quality basis. Cotton conveyor belt made of cotton knitted fabric in 2,3,4 bs thickness from 12" to 48" wide & in required length. 28 oz fabric, 3 ply construction, 1.5mm top & 1.0mm bottom rubber covers, 6.5mm thick. Tocklai & Tea board approved as per IS : 1892/latest available in 16" to 60" wide in any length with required vulcanising, tensile strength 1.4 kgs/mm min. & elongation at break 35% min. Aluminium moulded trays as per sizes recommended by Vinar, in 16 G & 18 G sheet without any corner welding, thus preserving fermented tea from any bacteria. M.S hangers for carrying the above aluminium trays or for aluminium/ pvc gamlas. All spares like dog chain, rails, trolley wheels etc. 3" x 9" 4" x 8"
6" x 6" 9" x 6"
8" x 6" 5" x 5"
2.5lb x 12G " 3lb x 12G "
2.5lb x Ordinary " 3lb x Ordinary "
Jute bags are most advised product for shopping Gift & Packaging as jute is natural fiber non toxic, bio-degradeable eco-friendly & a feet towards green revolution. 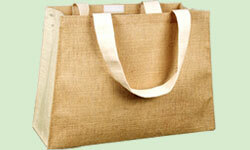 Bags made out of jute are most fancy in look and very handy as jute is manufactured in all colours & shades. The printing on bags can free than brighter up the look. Bags are stitched with cotton or rayon thread & can be Laminated with Polythene for water resistance. The jute bag have often of getting made in sizes as desired by buyer & there are no Limitation as compared to other products. Bag of jute are price effective too. We hope is get your valued enquiry for jute bags on which samples can be made as per your need. IN CLOTH - Dyed natural jute fabric in mostly white, green, red, black, natural jute colour, bi-colour, herring bone, jute cotton, special cream colour are preferred. PRINTING - Matter/design can be as per your choice with fast colour non-removable ink even upto 6 colour combination.